HOUSTON—Longtime dancer and dance teacher Deirdre Denise McClain was overwhelmed with joy and renewal after watching Shen Yun Performing Arts. “It is a new life of celebration, bliss, and that’s another characteristic that I received from just being here, was the bliss, the joy of living, I don’t have to survive anymore, now it is time for me to live,” said Ms. McClain. That’s the gift they gave me. Deirdre Denise McClain produces theatrical dance performances. She puts on performances and seminars to help women and children step out of past abuse and learn to cherish their life and future. She is a former Dallas Cowboys Cheerleader. Ms. McClain saw Shen Yun performance on Jan. 1 at Houston’s Jones Hall For The Performing Arts. I feel like I have been to heaven and back. “I feel like I have been to heaven and back,” said Ms. McClain. “The dancers were amazing, the music was fabulous. The choreography was just so fascinating, and just the harmony, the flow, the message that was given through the dance of love and compassion,” said Ms. McClain. Shen Yun Performing Arts seeks to revive the divine culture that flourished in China for millennia. 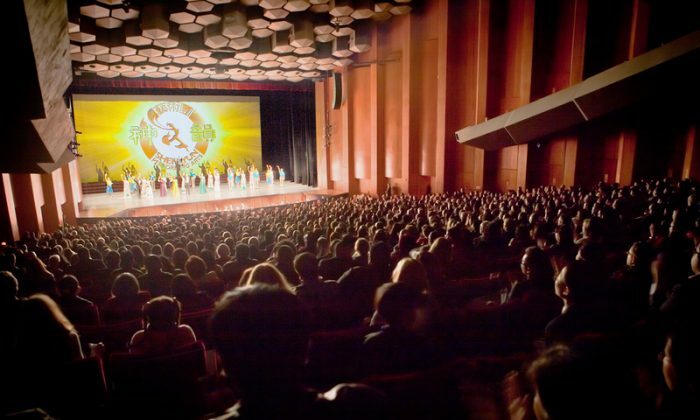 Through performance of ethnic and classical Chinese dance, Shen Yun strives to bring the virtues and values of ancient China to the stage. Ms. McClain was speaking of one of the narrative dances, The Power of Compassion. It is set in contemporary China, and describes an unexpected encounter between a policeman who is about to do something wrong and a kind man. “By sharing their world of compassion in dance, eventually that person came around to embrace compassion. To see all that in the dance, how it flowed, was amazing,” said Ms. McClain. It was really the divine here, in our presence through them. That’s what it was. The divine in our presence through the dancers and through the musicians.